Wake the Vote started as an experiment in civic engagement. We thought we could pull together a couple dozen diverse college students; travel to early caucus and primary states; volunteer for local campaigns during the summer; travel to the nominating conventions; engage in voter education and GOTV efforts in the fall; have an election night party; then go to the inauguration. On paper the plan was ambitious, but hardly outrageous. When I first talked with my university provost about the idea in 2015 , he worried it would be boring. Wake the Vote has been and continues to be many things. Boring is not one of them. In 2016 the first full Wake the Vote committed a year of their lives to American democracy even as it seemed to be crumbling around them. They are Democrats and Republicans and some who wholly reject partisan labels. Some grew up knowing hunger and want, others wealth and ease. Some exist comfortably in hegemonic identities of race, gender, and sexuality, while some exist at multiple marginal intersections. Some had never been on a plane before this experience; others had traveled and studied around the world. All of them have demonstrated remarkable vulnerability, courage, and commitment. When the process started — in Iowa, New Hampshire, and South Carolina — the students were randomly assigned to work for a new candidate each weekend. This meant they often ended up working for campaigns or parties they didn’t necessarily support. The goal was to allow them to learn about the mechanics of campaigns and to build a little empathy by having a deep immersion experience across the aisle. In our deeply divided nation, few of us rarely have a chance to actively work with others who are genuinely different from us. The experience can be enlightening. By the time we moved onto New Hampshire, Erica was a self-described “born-again Democrat” but her time on the Rubio campaign was important. She learned how good and reasonable people can get caught up in moments of personal charisma. And you can bet if she ever runs for office she has learned the power of visiting field offices and thanking volunteers personally. After being thrust across the aisle during the primaries, the Wake the Voters were able to work for candidates and issues of their own choosing. They logged thousands of hours with candidates and issues. Hannah went to Tennessee to increase the number of women elected in the state. David and Zach became committed organizers for voting rights in North Carolina. Daniella represented Wake the Vote at a national conference for young voters in California. And Katherine kept up a fairly impressive track record of logging serious canvassing miles, in pearls. During the Democrats’ historic sit-in for gun-reform legislation in June I got a text message: “Prof MHP, I am in the House Chamber. Interning this week!” The text message was from Carl, a Republican student from North Carolina. He was genuinely excited to be present for this bit of political theater and history. Later that month I caught a glimpse of him over Janet Yellen’s left shoulder. In a normal election cycle, these feel good stories of young people learning and growing in democracy might be all there is to tell of Wake the Vote. But 2016 is not normal. The summer of 2016 was brutal. Video of Alton Sterling and Philando Castile being shot to death by police sparked both protests and revenge killings of officers in Dallas and Baton Rouge. The massacre at the Pulse nightclub hit close to home for us, because one of the Wake the Vote leaders is a gay Muslim man from Orlando. Tensions and stakes were high by the time we boarded a bus bound for the Republican National Convention in Cleveland. The difference in tone and feeling between students was palpable at our first group lunch in Cleveland. Queer students in the cohort were angry about the RNC’s consideration of a conversion therapy plank. Students of color felt profiled on the streets near the convention center. Democrats in the group were seething about the idea that their Republican friends were considering casting a vote for Trump. Senior Hannah Dobie stood up at lunch and told us to all get real. She said Wake the Vote was not just a class or a field trip, she said it really mattered. She ripped the mask of politeness off our reunion and forced us to confront the difficulty of coming back together in the midst of a summer marked by racial violence, ideological division, partisan divides, and painful gaps that couldn’t be easily papered over with hash tags and swag. It was not the first time we have had to get real with each other; it certainly was not the last. In fact in only got harder as we moved thorough both the Republican and Democratic conventions. We started the school year in the heart of the 'swingiest' swing state of all, North Carolina, added new first year students to the cohort, and got to work bringing the lessons of our year to campus. In early October Wake the Vote entered an extraordinary collaboration with Big Bowl of Ideas to launch the UP to US art exhibit and election event hub modeled on the students’ experiences at the Politico Hub in Cleveland at the RNC and the Truth to Power exhibit at the DNC in Philadelphia. The exhibit was organized around four major themes: education, immigration, policing/community violence and voting rights/youth participation. It featured over 35 works by 12 artists from across the country. 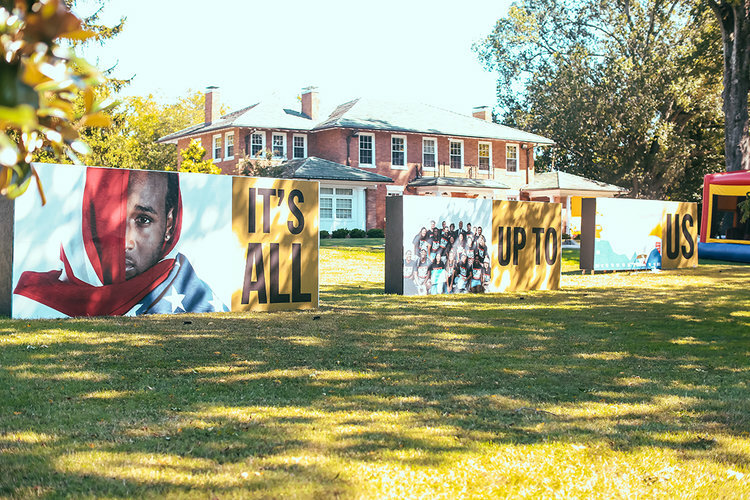 Students used the art exhibit as a space to host discussions about issues from multiple perspectives. We enjoyed visits with Peggy Noonan and Chelsea Clinton. MTV’s Jamil Smith watched the VP debate with us. We even had unspeakably poignant experience of being visited by the Mothers of the Movement who visited the art installation on police violence featuring the faces and stories of black people shot and killed by the police as well as images of officers using models of community policing. 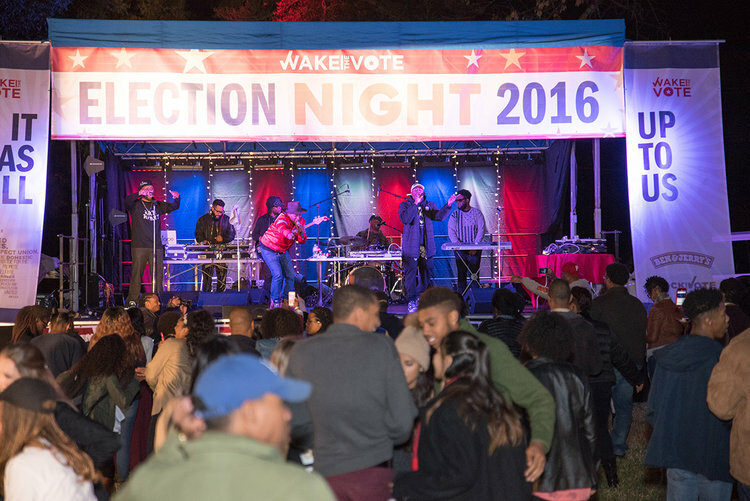 On election night, Wake the Vote hosted what we jokingly refer to as the only bi-partisan election night party in the country. Nearly 900 people showed up to enjoy live music and free Ben and Jerry’s ice cream in a truly diverse crowd that included college students and community members. Wake the Vote was not a magical inoculation against the divisive power of November 8. When the election results were dramatically different than most expected our extraordinary cohort was agonized. Democrats were shocked and hurt. Trump supporters in the group wanted to celebrate. Some did; others felt they couldn’t. Many students were angry with me, as though my insistence on bi-partisan cooperation throughout the year had created this unfathomable result. Time alone did not heal the wounds. There are students in the cohort who still eye each other warily, who are uncertain if the bounds of trust built on a cold bus in the New Hampshire snow or sweltering July days in Philadelphia will hold. I did not know if the cohort would hold. I was prepared to cancel the inauguration trip. Then something rather extraordinary happened. The students said, let’s go. Democrats and Republicans. Let’s go. To the inauguration and the March. We will do both, because it is how we have done everything else. Both sides. All of it. We will stand and bear witness to all of it. We will finish the journey we began together. I am neither the author, nor the protagonist, of this story. This is their country. Their story. We are not done yet. We will keep waking the the vote. Wake the Vote: 2018 begins now.